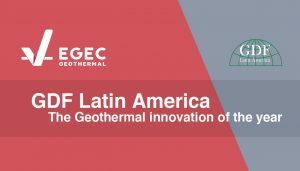 IDA Fund Management, LLC (IDA), consisting of Dewhurst Group, LLC and Interlink Geothermal, LLC, is very proud to announce that the Geothermal Development facility (GDF) has been awarded the European Geothermal Innovation Award for 2018. The GDF is a risk mitigation initiative within Latin America created by KfW Bank within Germany and the European Union. The GDF is managed by IDA. The GDF was competitively selected for the award from 19 nominated projects. GDF is the first multi-donor climate initiative offering risk mitigation for surface studies and confirmation drillings during the early exploration phase of geothermal development. There are 10 eligible countries within Latin America. A total of 120 projects have expressed interest in the GDF to date. Eight projects were selected for grant awards during the first call, completed in October 2017. If fully developed, this represents a potential of 285MWe of new geothermal power development for the region. GDF awarded approximately €22M in grant funding which could yield €1.6billion in new investment for Latin America. The second call is currently ongoing. Projects representing more than 705MWe of new electricity have expressed an interest in GDF grants. More than €20M in grant funding has again been requested. The second call, if fully funded, would represent a leveraged need for €3.8Billion in new investments.